We’d love your help. Let us know what’s wrong with this preview of A Spark of White Fire by Sangu Mandanna. Raised alone and far away from her home on Kali, Esmae longs to return to her family. When the King of Wychstar offers to gift In a universe of capricious gods, dark moons, and kingdoms built on the backs of spaceships, a cursed queen sends her infant daughter away, a jealous uncle steals the throne of Kali from his nephew, and an exiled prince vows to take his crown back. To ask other readers questions about A Spark of White Fire, please sign up. Why aren’t more people utterly entranced and excited about this masterpiece of a book? A Spark of White Fire is, in the literal sense, a story of cosmic scope and mythic proportions. It was a seamless melding of fantasy and science fiction (my go-to genres! ), spun from the rich fabric of Indian mythology and folklore. And yes, I was utterly captivated, swept up in this dazzlingly kaleidoscopic world of spaceship kingdoms, celestial battles and whimsical, powerful gods. The prose is clear, precise, but nothing outstanding. Yet, there is something enchanting about the storytelling—so A Spark of White Fire is, in the literal sense, a story of cosmic scope and mythic proportions. The prose is clear, precise, but nothing outstanding. Yet, there is something enchanting about the storytelling—something wonderful and luminous like stars. The settings are stunningly vibrant, awash with a radiance that comes bursting off the pages. A Spark of White Fire explores themes of ambition and rivalry, loyalty and betrayal, and the plot is tense, energetic and steeped in political intrigue. But at the core of it lies the struggle between fate and free will, and it was fascinating seeing how the two intertwined together, twisting and tangling the weave of the plot. Yes, the story sparked something inside of me. But it didn't set me on fire. To be honest, I can't quite put my finger on the main problem, hmm. There's a lot of info-dumps, sure, and author does have an unfortunate tendency to insert paragraphs full of telling not showing between dialogue. Or perhaps it's because most of the supporting characters simply weren't engaging enough for me? I did, however, adore Esmae. She was such a compelling lead, full of conflict and misperceptions—someone who was repeatedly torn between loyalties and forced to reconcile competing values. She desired peace, yes, but there was something fierce in her too—a flame, burning hot and white, that rose and consumed, until it blazed a path across the universe and split it into two. A Spark of White Fire is an example of political intrigue done right in YA, and one of the best YA books set in space I've ever read. I don't know if it's right to call A Spark of White Fire "science fiction". This Mahabharata retelling is a genre-bending gem - which isn't as common as it should be in YA - because it's set in space, but it reads like a high fantasy novel. There are gods, talking spaceships that are just the space version of fantasy talking dragons, a beautiful city float 4.5 stars. There are gods, talking spaceships that are just the space version of fantasy talking dragons, a beautiful city floating near a nebula, magical weapons blessed by the gods, and people fighting over a throne. A Spark of White Fire doesn't even try to feel like a sci-fi novel; the space setting is just there for the aesthetics. And you know what? The descriptions in this book are beautiful and the aesthetic was worth every time the thought of people fighting with bows and arrows in space broke my suspension of disbelief. A Spark of White Fire follows lost princess Esmae, who is now ready to reveal her identity and fight for Titania, the sentient, unbeatable spaceship blessed by the gods. Winning Titania will help her win back Kali's throne, which was stolen from her brother Alexi by their uncle Elvar and his adopted son Max. It's a story about a torn family and complicated loyalties, and I loved how it played out - so much that I didn't mind that some parts of it were predictable, because Esmae's character arc was surprisingly subversive and went exactly in the direction I wanted it to go. One thing I don't like about political intrigue in YA is that there's often a good side and a bad side - sometimes the side you thought was the good one turns out to be the bad one, but that's as far as plot twists usually go. Here, there's not a "good" side, and if you can argue one is better than the other, you can't ignore the fact that, in some way, everyone is wrong and has been wronged. I love complex political situations and I love competent heroines who know how to exploit them (...even if sometimes they fail). Another thing I really appreciated was the way in which the focus switched from "let's take the throne back to the rightful owner" - which is a trope I hate, especially when the supposedly right person is a teenager - to "let's prevent a war, we don't want millions to die because you hate your cousin". And preventing wars is more difficult than starting them. Sometimes, the hate you feel for your cousin is more dangerous than the cousin himself. This book wasn't flawless - why have a step-cousin romance when you could... not have a romance (at least there wasn't a lot of it?) - but it surprised me just how much I enjoyed it. I didn't think I would ever love a story about a lost princess in space, but this book did something new with this trope. Another thing I could have done without was Esmae's comment that people who don't date are afraid of happiness - which was especially surprising because she had just said that dating wasn't a priority for her, but of course she ends up falling for a boy a few chapters later. Full review is up on my blog, The Quiet Pond. I don't say this often, so listen up: THIS BOOK WAS AMAZING FROM START TO FINISH AND IS ONE OF THE BEST BOOKS I'VE READ. My goodness, this book is brilliant. An effortless new all-time favourite book. - The book follows Esmae, the twin of an exiled prince, who longs to reunite with her family and help them win back their kingdom. Until, of course, this plan falls apart and she's met with obstacles she could never have anticipated. - This is the sort of s Full review is up on my blog, The Quiet Pond. - This is the sort of space-opera I've always wanted to read about: sentient ships with attitude; divine intervention and gods pitting their favourites against each other; celestial weapons; kingdoms built on spaceships. - The worldbuilding is gorgeous, put together by a simple but elegant system of gods and technology. - The plot is brilliant, and I was honestly entertained throughout. There's political intrigue, an organic romance, betrayal, fighting fate, and complex family dynamics. - Ok but like... my favourite character was Titania, the sentient warship. I adore her. This story left me in a breathless heap of emotions, astonishment and fangirling. If this book doesn't get fanart then you're all doomed. A world where sci-fi, fantasy, gods and kingdoms are living together is the themes in A spark of white fire. I would say that you take Game of Thrones, pull it into space, making it into a retelling of the Mahabrahata, and you have an unforgettable story! A Spark of White Fire reminds me of bacon with ice cream. A mixture of two incredible things that are shockingly even more pleasing when mixed together! I’ve never before had the great fortune of reading a novel that perfectly blends elements from so many genres in a seamless manner. The juxtaposition of Indian Mythology in a vivid outer space setting, stirred up with wonderfully complex characters and fantastic politic intrigue, is a recipe for a brilliant story. All the characters are unique, with their own motives and hidden agendas. The story spirals down numerous twists and turns, making it challenging to discover who is trustworthy. A thrilling adventure from start to finish! Space operas are quite new to me. I am not overly familiar with this genre, and haven’t read many novels with similar settings. Nevertheless, I thought that Mandanna beautifully paints a vivid universe, filled to the brim with originality. Having known before hand that this novel combines aspects from both fantasy and science-fiction, made me a tad skeptical. However, these doubts proved to be futile, because all the elements tie together in a believable and practical manner. The inclusion of mythological gods and prophecies is also a lovely addition to the world. How the gods interact with and form relationships with humans is so intriguing, and explained well. I particularly admired the bond between Esmae and Amba, the War Goddess. A lovely protagonist! Esmae, herself, has righteous intentions, but her perception of others is incessantly being altered. The faith and hope she places in people is a dangerous game that she is merely a pawn in. How she forges a path amidst this chaos is so enticing. At her core, she is self-less and possesses a desire to protect all those she loves. This is such an inspiring trait to have in a leading character, and is quite noteworthy considering how she hasn’t experienced much love and sacrifice in her childhood. Rather than act with hostility and distrust towards others, she opens her heart and helps in any way she can. Although this is ultimately a character-driven story, the plot is fairly fast-paced at times, and will certainly keep you at the edge of your seat. I love the moral ambiguity of many of the characters. It’s no secret that I adore characters whose moral compasses are askew. A Spark of White Fire has such a brilliant cast of characters, all of which have understandable intentions, but questionable means to achieve their goals. Alexi and Max are both mysterious in their own ways, and I love how their backstories and true personas gradually reveal themselves in time. The forbidden romance between Esmae and Max progresses naturally and I truly did enjoy it. My favorite character from the whole bunch, is surprisingly Rama – the childhood friend of Esmae’s who is incapable of conjuring a foul thought. His repulsion to do anything physically exerting, cracked me up, and he is honestly the sweetest little bean in the world. This novel truly was a delightful surprise. The lone reason I didn’t rate this novel five stars, is because I found the King to be unrealistically immature, and the plot to drag at a few periods. Despite this, the hodgepodge of genres mixes together flawlessly, and the complex characters work in accordance with the wonderfully intricate world to produce a fantastic story. I can imagine A Spark of White Fire being enjoyed by fans of any genre, and think it’s a marvelous example of why Young Adult novels are so successful in this day and age. I can’t wait to read the next installments in this trilogy! This book was such a pleasant surprise! Esmae is stuck living in the shadows of her world with so much to offer and yet her value is unnoticed. She’s a servant, with only a select few who know that she's a princess in hiding, and decides to claim her stake in the politically shifty landscape when she publicly wins a contest for the most powerful warship in existence. Tired of being undervalued, she enacts her plan to win back her bro This book was such a pleasant surprise! Esmae is stuck living in the shadows of her world with so much to offer and yet her value is unnoticed. She’s a servant, with only a select few who know that she's a princess in hiding, and decides to claim her stake in the politically shifty landscape when she publicly wins a contest for the most powerful warship in existence. Tired of being undervalued, she enacts her plan to win back her brother’s crown and reclaim her place within the family who threw her away. This story makes me think of Greek mythology in space. Gods exist in her world, though they try not to intervene but act more as viewers to the story. Kind of like the Greek gods in their douchy indifference to the plights of puny humans. They basically pick their favorites and sit by with popcorn, though at least our heroine has one that actually cares for her. The gods are supposed to be references to Indian stories, but since I'm unfamiliar with Indian mythology, it reminded me instead of the Greeks. Esmae has been watched over her entire life by Amba, the war goddess. Amba tries to guide Esmae away from trouble, but Esmae is tired of being without a family and living as a nobody. She wants the spotlight. She wants people to see her potential. She’s been trained in secret, so skill-wise, she’s a badass. Her primary skill is her aptitude for strategy, and she’s confident she can win the war that’s brewing. She ignores Amba's advice and throws herself into the political game. Esmae wins the contest for the sentient warship Titania and uses it as leverage to implant herself in her uncle’s household as a double agent. Her uncle took the crown that should’ve belonged to her brother, and then exiled her family. He’s universally hated. But the situation isn’t as black-and-white as it seems. Her uncle was unjustly denied his own birthright, and so he believes he deserves the crown — his claim isn’t entirely wrong, but her brother Alexi still has an equally valid claim. Even though her uncle is paranoid and anxious, and really wasn’t built for the responsibilities required as a ruler, it’s hard not to be sympathetic towards him when he welcomes Esmae back home and gives her the family she’s always wanted. Though she enters her uncle's house determined to win the crown for her brother, she can't help seeing the gray areas of the situation and tries to find the middle ground. Turns out the "good guys" aren't entirely good, and the "bad guys" aren't straightforward either. Yay, complexity! I like Esmae, but she has so much room for growth. Initially, it feels like she's a child playing dress-up. She imagines herself in a bigger role, and ignores the advice of those around her to push herself into the big leagues. She's strong, but she's overconfident. She's not ready for the game she's playing. This does make her relatable, though. She's a mixed-bag character. Too cocky, too naive, but also skilled and clever; it's a great initial heroine recipe. I think she'll grow into the main-player role and become that fierce contender, and I'm looking forward to it. And the adopted son of her uncle, Max isn’t what he appears either. He’s known as the jealous prince who helped his father usurp the throne, and he’s just as hated. But he loves his parents, and without his intervention, things would be much worse for Esmae’s brothers. Like Esmae, he’s been overlooked his whole life — hence the jealousy he has for Esmae’s brothers — but he’s trying for the best outcome for the most people as well. I love the gray-ness of his character. This is kind of a stretch, but he reminds me of Cardan from The Cruel Prince. Not as dark, but the "jealous prince" descriptor first implanted that thought, and the fact that he's so misunderstood just cemented that comparison in my head even further. He's an underdog, but still in a position of power. And the protag hates him. Just to disclose my bias, I will read ANYTHING where there's a character that can be compared to Cardan. There’s a hate-to-love arc for Esmae and Max that has a teensy bit of steam and a lot of future potential. This is one of my favorite tropes, so by default, I can't help but root for this ship. There’s a deeper story to Max which is pretty easy to figure out on the hints they give you. Not exactly in romance territory yet, but it's headed there (it has to be!). This book has a spiral shape to it –– Esmae is essentially swirling down the path she’s created, and though she’s warned what will happen, she’s determined to prove the gods wrong and forge a happy ending. There is definitely some negative foreshadowing for the future books, and it seems that the story will get a lot darker before there’s some light, but I’m looking forward to watching it all unfold. Esmae's story brings up the destiny versus free will debate. The gods are telling her that if she makes the decisions that she wants to make, the outcome will be disastrous. But she is determined to make a different outcome. It's a tad frustrating watching her play into the hands of fate, and at times she seems presumptuous for believing that she can achieve her goals, but at the same time you're still rooting for her to prove destiny wrong. In the end, Esmae is betrayed by those that should love her, though still beloved by the gods who watch her story. Even though the gods favor her, it doesn't really help her get what she wants. She's not place her on a pedestal; she works for her recognition. Though she tries to overcome her moral compass to win back her family, she sees the gray areas on both sides, and tries to come to the best solution. But when she’s surrounded by people that don’t care about those that’ll be sacrificed in a gigantic war and just want power, it’s inevitable that she’ll be hurt in the process. They don't want the best solution; they want her to choose a side, and want to use her for what they can do for her. Her good intentions end up isolating her, but it also brings out her strength. She goes from naive optimist to betrayed and defiant heroine, and I love it. When those that are supposed to love her betray her, it *sparks a white fire* that will burn the universe (title drop!). I'm totally biased, but I love this book. I loved every minute of writing it and I can't wait for you guys to meet Esmae. I so, so hope you love this as much as I do. Something you should know about me - I absolutely love and adore the Mahabharata since childhood. I've read so many versions of the epic by different authors in multiple languages and I keep continuing to do so even now. So, when I got to know about this book, I knew I was going to read it, despite the fact that I don't enjoy science fiction and never read books set in space. I just couldn't imagine not reading a YA novel based on the Mahabharata and I had very high expectations right from the b Something you should know about me - I absolutely love and adore the Mahabharata since childhood. I've read so many versions of the epic by different authors in multiple languages and I keep continuing to do so even now. So, when I got to know about this book, I knew I was going to read it, despite the fact that I don't enjoy science fiction and never read books set in space. I just couldn't imagine not reading a YA novel based on the Mahabharata and I had very high expectations right from the beginning and I'm so so glad to say that this one didn't disappoint. I'm very happy to have read this amazing novel and upset that I have to wait a long time for the sequel. And thank you so much Nandini for reading this along with me, it's always fun discussing with you. The first thing to keep in mind is that this book doesn't really read like traditional science fiction. You have your spaceships, space travel among stars, different planets and advanced technology - but you also have immortal gods and goddesses who enjoy interacting with mortals and meddling in their lives (albeit indirectly), boons and curses and destinies and prophecies, traditional warfare with bows and arrows and swords and celestial weapons, and kingdoms rife with political intrigue in a power struggle for the throne of Kali. The author does a wonderful job of combining science fiction with epic fantasy and that's what impressed me the most. The world building is lush and vibrant and very easy to understand and I loved the descriptions of the various kingdoms, the differences between the planets vs kingdoms on spaceships and how traditional warfare works in such a technologically advanced world. The characters are definitely the main strength of this story. Esmae is what we would expect from a YA protagonist - strong, compassionate, loyal to her cause and family. What's surprising is that despite being abandoned by her family after her birth, she loves them a lot and wants to do everything in her power to restore her brother to his rightful throne. She has always hated her evil uncle, the usurper king and his son and makes plans and counterplans to gain their trust and to destroy them from within. But as she spends more time at home and gets to know them better, she realizes that no one is black and white and everyone has wronged or been wronged. Despite being a trained warrior, she is not a warmonger and wants her brother as King but not at the cost of thousands of innocent lives. All the side characters are well fleshed out and play important roles in the progression of the plot. Every single action has very unintended consequences and despite Esmae's meticulous planning and Max's efforts to stop the war, things don't always work out the way they want them to. The writing is very easy to follow and probably even simple, but I really loved that. I got through this very quickly and in a single sitting, didn't want to put it down at all because it was very fast paced and action packed and I couldn't wait to read what happened next. The themes of importance of family - both blood and found, about destiny vs free will and how much control can anyone exert over their future when there are gods who have their own agendas, the justification of war and collateral damage in the grand scheme of things - all form the crux of this book and give us a lot of food for thought, while making us empathize with all the characters, whether we initially thought them as good or evil. The story is also full of twists and turns and just when you think you have figured out where the story is going, the author takes it in a very different direction and it shook me with all the emotional upheaval. The ending broke me because I just did not see that coming and it just raises the stakes in staggering ways for the sequel. A good thing is that this book doesn't end in a cliffhanger, but the story is nicely setup for a much explosive second book. Obviously I couldn't stop myself from comparing every single action and character in the book to the Mahabharata and I had hell of a lot of fun doing it. There are lots of similarities but differences too and the best part is figuring out who is who. Resemblances to characters like Bhishma, Shakuni, Dhritarashtra and Gandhari are uncanny, but the fun is when I can't decide who Esmae and Max and Alexi or even my favorite sassy spaceship Titania represent - they are a mix of both the Pandavas and the Kauravas and I think it will be more fun to see where they go next in the upcoming books. The way the author blended Indian mythology with fantasy and science fiction is brilliant and I am so thankful to Sangu for writing this book. It just gave me so much joy that I can't describe and that's why this review of mine is pretty incoherent. So grateful I got to read an early copy! This is a super addictive, captivating read. I love the way Sangu blends fantastical elements with sci-fi and the Indian mythology inspiration is rich and unique. A heroine you’ll root for from from page 1 and a fast-paced plot with so many twists and surprises. Loved it!! 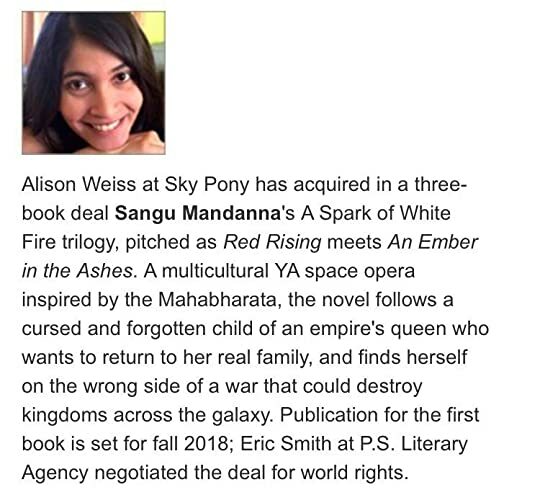 A Spark of White Fire, by author Sangu Mandanna, is the first chapter of a major new trilogy with everything you want: complicated family dynamics that could rip the universe asunder, exhilarating action aboard an epic warship, swoony romance that will have readers begging for more. The story itself was pitched as Red Rising meets An Ember in the Ashes. It is a multicultural YA space opera inspired by the Mahabharata. Mandanna really does not beat around the bush, and I really appreciate that. Right from the start you're thrust into the action and stakes, and although it was a little surprising and took a chapter or two to understand and get used to, it was so worth it and far better than the alternative info dump. Although there's no formal prologue or introduction etc., it was easy to adapt to the idea of gods and the science fiction aspects, even as someone unfamiliar to the Indian mythology, which I really appreciated. I don't really know a lot about Indian mythology or gods, but the way Mandanna wrote it made it accessible to people like me without sacrificing the integrity or other aspects of the novel. Her writing style is straightforward, yet lush in her descriptions and worldbuilding, and it creates a very engaging fantasy world. I found the entire world to be really well built, yet easily understood, which was almost really surprising because I usually struggle a bit with fantasy terminology, especially when there's a lot of places etc. But the royal family dynamics (which did get a little tangled) all made sense, which is more than I can say for a lot of other books. And I liked how, even though it's a bit tropey in the idea that Esmae is the lost princess etc., we're letting POC have their time as lost princesses and other "outdated" tropes. The family dynamics though were definitely some of my favorite parts of the book, and I like how, after all these years, Esmae is finally reunited with her family, and it makes for a very interesting story. There's a lot of struggle with loyalty as there's a struggle for power between each side, and I think that's what really hooked me with this story, as I wanted to find out the why and who would prevail (or, how they'd reach a truce). It ended up being very spicy figuring out, and I'm excited to read the next installment! Honestly, this book qualifies a little better as fantasy than science fiction, but I ended up not minding in this case, because the sci-fi aspects were still decently heavily featured and there was a lot of space stuff. But, along with the space stuff, were things like gods and their interference in the life of mortals, so it ended up balancing out. I thought the way Mandanna interwove both elements made this book very comprehensive, so I really enjoyed that. But, looking back, I do feel a little bit like some of the plot points were a bit weak. Like, the reason some things happened (especially the ending) felt like a lot of luck and fate and due to small technicalities and things that could have easily gone differently. I kind of wanted something larger and more twisty and more foreshadowed in a way, but I don't think this takes too much away from the story as Mandanna still does a good job of making the pieces work together. Plus, A Spark of White Fire was just entertaining. I was engaged and I wanted to keep reading. All throughout the book I had inklings about what would happen and the various machinations that were potentially going on that Esmae didn't know about. Some inklings came true, others didn't, but overall it made the story a lot more entertaining. Although I feel like the last 50 pages were a lot better and more action-packed than the rest of the novel, I still feel like A Spark of White Fire did a good job in engaging the reader overall. I just love how we're getting more POC in SFF and reading this was such a fun story that I definitely enjoyed! Not only is there a gorgeous space cover on this book, but there's also all sorts of fun, mythical and science-y elements that make it an engaging read. If you're looking for an engaging space opera featuring Indian mythology that creates a gorgeously detailed world, definitely check out A Spark of White Fire! Or, if you're just looking for something good to read, pick this up too. Thank you so much to Sky Pony Press, Edelweiss, and The FFBC for providing me with a digital review copy in exchange for an honest review! I loved every aspect that there is in this novel! The atmosphere of the world building is more than what I had anticipated, space opera with the blending of Indian mythology of Mahabharata. It was filled with vivid imagery. What blows me away is the mixture of modern technology, the presence of ships, advanced even for that matter. And the rich cultural beliefs and its weaponry choices. I adore the blending of both science fiction and fantasy in here. The characters' was another story. They are filled with complexities and each is driven by the goal they are hoping to achieve. They are flawed both the mortals and even the gods and goddesses. Each relationship in the characters got me thinking who's going to betray who? Or will they really? Okay, the grayness in this specific one but then maybe she's right? It certainly gave that effect on me. The trope usage was well handled too. From the premise alone there is a lot to spot in there, I thought it'll be just another normal but the effect of A Spark of White Fire is the complete opposite. Behind these tropes are twisted that was genre-bending, blown me away goodness! The plot and that literary ending are high, highly loved. I was beginning to worry what could top those events unfolded... then Sangu Mandanna gave us that ending. Phew! The writing, yes, I loved it. Prior beginning to read this I had no background whatsoever with the mythology, I have read some basic summaries over it to get in sync. Upon continuation, it isn't that really hard to grip and continue. For the way it was laid out for the reader was all I needed. I am excited how the series will go! 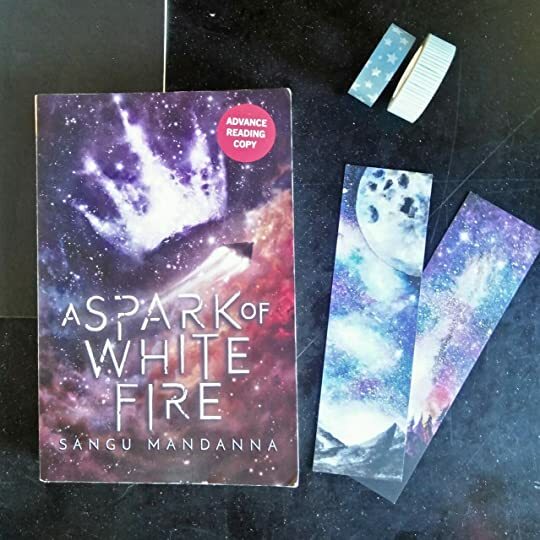 Despite being heavily influenced by the ancient epic Mahabharata and other Indian lore, there is nothing quite like Mandanna’s novel – A Spark of White Fire is an absolutely unique, genre-defying gamechanger in YA. - Perfectly seamless blending of fantasy and science fiction elements! - Intricately developed world-building nicely integrated with Indian mythology! - Meddlesome gods and goddesses, and celestial weapons blessed by them! - Flawed, morally ambiguous characters of color! - Family complexities and character relationships! - Compelling plot with political scheming and fighting against the tides of destiny! - A thrilling, satisfying conclusion that sets up the sequel very nicely! Overall, A Spark of White Fire is wonderfully imaginative, culturally rich, and fascinatingly complex. It goes without saying that I absolutely enjoyed it! With a flawed heroine who grows stronger in the face of adversity, complex characters that are more than what meets the eye, a compelling plot with themes of family politics, betrayal, and loyalty, A Spark of White Fire is a brilliant space opera no one should miss out on. Disclosure: I received a physical ARC of A Spark of White Fire from Samantha Shannon from Twitter. Thank you so much! From the moment they walked in here, they saw only what they expected and missed the truth. A Spark of White Fire follows Esmae, a lost princess who is ready to reveal her true identify fighting for Titania, an unbeatable spacesip blessed by gods, and help his brother Alexi to win back his throne in Kali, which was stolen by their uncle Elvar. Indial mythology in space + political intrigue? I was sold when I hear about it, and to be honest I wasn't disappointed with what I got. The best part is the political intrigue, there's not a good/bad side because in some way everyone is wrong and has been wronged and one side isn't better that the other. While Esmae wants to return to her family in Kali, she discovers that her evil uncle who stole her brother's throne isn't entire evil, which isn't the best thing to found out when you're trying to take his throne to give it to the rightful heir. But also, that ending, I needed the second book yesterday. I'm here for Esmae crushing everyone in the universe. 📣 A Spark of White Fire is here! Don't sleep on this epic adventure! "Your arrow was a spark. A spark of fire so hot and white that no one will be able to put it out. And even a spark of fire can consume an entire forest if it can jump from tree to tree...Watch as one act leads to another and then to another after that. Watch the trees pass white flames on. Watch the forest burn." 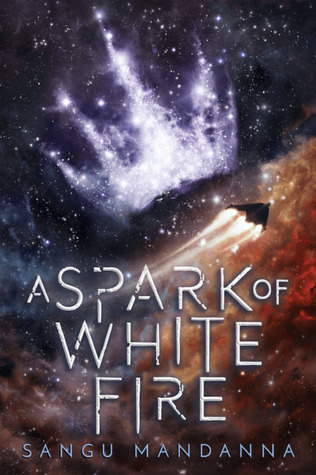 If you enjoy political intrigue, space operas, complex characters, and amazing worldbuilding A Spark of White Fire 📣 A Spark of White Fire is here! Don't sleep on this epic adventure! If you enjoy political intrigue, space operas, complex characters, and amazing worldbuilding A Spark of White Fire is for you! This is one of my most anticipated releases in a year with a large number of young adult releases focused on the politics of rule, and I am happy to say that this book did not disappoint! This is a genre-bending retelling of the Mahabharata that is easily accessible to YA fantasy readers and I cannot wait for you to fall in love with Esmae, Rama, and the rest of these characters! This seemed a very foolish question. "Why not?" This book is told from our heroine Esmae's perspective and is an action packed and fast-paced read that I absolutely devoured. The synopsis of the book is an excellent primer to this story's plot and Esmae's backstory, and in the interest of spoilers I will not be delving deeper into the characters as I typically do; just know that they are each wonderful in their own way and complex. The kingdom doesn't look like it's built on top of a space station. It looks no different from the kingdoms on planets, which was a deliberate choice to make the first citizens' transition to life on a ship that much easier. While A Spark of White Fire is set in space, I would classify this book more as fantasy than science fiction. The setting merely sets the stage and adds an interesting dimension to the worldbuilding. This a world where the gods can form relationships with humans and boons are offered for great feats made. One such boon resulted in the building of a near unstoppable and sentient spaceship named Titania, which will be gifted to the warrior who bests the challenge. Esmae's plan is to win Titania, but when she does she sets down a path the gods have warned her about. "Mortals make their own choices, and we can't control them, but they inevitably lead themselves to their own fates - their own fixed points. And those points, in time, will happen. One way or another, they will happen. They already have happened." A running theme of this tale is how much control do we have over our own destiny and being the pawn in a cosmic game in which you (seemingly) have no control. In a world where words uttered by mortals favored by the gods turn into curses, characters are forced to lived with the consequences of another's actions. These are themes that are common in YA fantasy but done so well here as these themes are prevalent in Indian mythology as well; this story reads true to the Indian myths that helped inspire the story. Excellent worldbuilding that is done throughout the book without ever feeling like an infodump. The world is vast, as are the characters within it, and I absolutely cherished this tale! We all know that I love complex characters, especially villains that are not strictly evil. This is definitely a tale where Esmae's perceptions of people are constantly being challenged by her interactions with those she has villified in her head, and she cares so much for her family and the people of Kali that her feelings come off the page and wiggle their way into my heart. There is also lgbt rep with a side character that I hope we see more of in the rest of the trilogy! This book is not without its faults. Some readers may be bothered by Esmae's portrayal as "The Chosen One," but in this case for me it didn't bother me since it is common in Indian mythology. I found King Elvar's childlike behavior annoying to the point that it at times ruined my enjoyment of the book. I understand that being a usurper king that is blind and reliant on others would be stressful, particularly when you have a power-hungry ally that uses fear to control the throne and opposition that is beloved by the people; however, throwing tantrums when you are a full-on old man is just uncomfortable. While I have read the Mahabharata and countless other Indian myths as part of my undergraduate education, this story is not one that requires knowledge of the original myths as the themes fit so well into the young adult sff genre: kingdoms, betrayal, ascension to rule, family politics. Free will versus destiny and every action you take leading you unwittingly toward prophesy. The story is accessible and enjoyable for all, but will be especially enjoyable to those familiar with the source material. As a note, I did struggle a bit with having a main character with the name of Rama because my first association always is with The Ramayana - and considering most of the character names weren't mythology inspired, I found it a little distracting. Overall I really enjoyed this book: you will find a vast fantasy world inspired by Indian myths with strong and complex characters that are not as they seem, devotion, sacrifice, betrayal. I love when my characters are put through the ringer and come out stronger and I cannot wait for what is in store for them. I am happy to say that the book does not end with a giant cliffhanger. It wraps up some things and sets up others for the next installment and I am excited to see where Mandanna goes next! When I first caught wind of this book earlier this year, I was so excited and I am so pleased to say that it did not disappoint. I hope you give this gem of a book a try because it is wonderful. Many thanks to the publisher for providing me an electronic advanced reader copy of this book via Edelweiss in exchange for my honest review. Quotations taken from an uncorrected proof and may change upon final publication. You know, when I pick up a science fiction book, I'm typically not expecting Gods and swords and arrows and kingdoms and all things fantasy. And when I pick up a high fantasy, I'm typically not expecting people living permanently on spaceships and frequent interplanetary travel. These two things are very, very different, and I really wouldn't expect them to work out together, but in this case they totally did!! The book opens with Esmae ready to enter a competition for the best warrior to win the You know, when I pick up a science fiction book, I'm typically not expecting Gods and swords and arrows and kingdoms and all things fantasy. And when I pick up a high fantasy, I'm typically not expecting people living permanently on spaceships and frequent interplanetary travel. These two things are very, very different, and I really wouldn't expect them to work out together, but in this case they totally did!! The book opens with Esmae ready to enter a competition for the best warrior to win the most powerful, impossible to defeat spaceship in the world. She plans to give this to her brother, who was wrongly exiled from his kingdom, and take back the throne from their cruel uncle. The world building here was phenomenal! I loved reading about all the different planets and spaceships, as well as all the Gods and mythology. I'm not familiar with Indian myths/stories, which this book is based on, so I really enjoyed getting to discover them. The premise of fantastical elements in space also gave me Lunar Chronicles vibes, and that's basically my favorite series in the universe so that should tell you how incredible this world was set up to be! What I really loved was how unclear and morally grey everything is. At first everything seems very typical, wronged prince, lost princess, usurper king, etc, and parts of this premise definitely weren't the most original, but as I got deeper into the story, it became less and less black and white and more and more grey. As everyone's motives start to become less clear, Esmae as well as me while reading it started to question which side she should really be on: to whom she should be loyal to and why. I loved seeing the tangled web of politics play out, and being unsure for the entire novel about who I should really support. I loved the characters as well! Esmae is such a fierce warrior, but also she just so desperately wants to have the family that she never got to have, and I really just wanted to reach into the book and give the girl a hug! There were a few times that I was kind of annoyed with her actions, and how determined she is to be independent and not play by the rules even if it was kind of stupid, but for the most part I really loved her. The romance here was...unnecessary. It was between two people who are related to each other, and I guess technically they aren't related to each other since one of them is adopted...but still. It seemed icky and I was like really why is this necessary? And even if they weren't related I still didn't get all the feels from the romance it was just kind of meh. This is an #OwnVoices review. This was one of my highly anticipated reads because a sci-fi spin on a beloved and revered classic of Indian mythology really intrigued me. As the source material is vast in its scope, I was wondering how a trilogy was going to pay homage to that. It turns out that it did so much better than what I was expecting. I absolutely adored each and every one of the characters in this book. They were complex, multi-layered people with their own motivations. The clear divide b This is an #OwnVoices review. I absolutely adored each and every one of the characters in this book. They were complex, multi-layered people with their own motivations. The clear divide between good and evil that existed in the Mahabharata was blurred wonderfully by the author to create realistic characters. By the time I finished the book, I was not sure which character I wanted to root for and I think that's a clear indicator of how well the characters were portrayed. I also loved how some of the characters were a mix of two or several different characters in the original myth. During the initial stages of the book, I had a hunch on what would transpire but the author took the story in a completely original path, which pleasantly surprised me. The twist at the climax genuinely shocked me. The tension was maintained very well throughout and kept me thoroughly engrossed. Mandanna also blended elements of science fiction and fantasy very well, creating a diverse universe where spaceships and gods co-existing made perfect sense. It was quite apparent that a lot of thought and careful research went into each and every aspect of the storytelling, all of which left me spellbound. I enjoyed this read from start to finish and cannot wait for the sequel to come out! The aspect I appreciated the most was how it took something so familiar to me, something I had grown up on and did something new and completely unexpected with it in a way I didn't know I wanted more of until I picked this book up. This is #OwnVoices literature at its finest and all the different elements in it make my Indian heart so very happy to see on paper. I would highly recommend this book to anyone craving for an excellent mythological retelling and an epic sci-fi/fantasy story. However, I will say that those familiar with the story of the Mahabharata will find this book a lot more interesting and less overwhelming. I would not recommend this book to a beginner in any of the genres mentioned. Edelweiss granted me this ARC in exchange for an honest review. And honest is what I will offer you. I fell in love with this story. And it utterly destroyed me. And as the minutes tick down, the pieces move into place. Who knew such a girl would become A Spark of White Fire that would burn the whole world down? A girl who was just a pawn became a queen. An e Edelweiss granted me this ARC in exchange for an honest review. And honest is what I will offer you. This book is a journey I couldn't possibly leave. It had me screaming in disbelief and sheer amazement, and it had me crying from grief. I can't remember the last time a book took me on an adventure of emotions this tremendous and left me to pick up the pieces, craving for more destruction. Tell me, how does one grow attached emotionally to a ship? Idk. Read this book and you tell me how it happened to you. This book is a masterpiece of calculation. The plot is chess, the characters all have secrets vital to the world building, every bit of information is important to remember, and most of all LOVE AND DEATH AND SECRETS AND LIES AND BATTLES AND SPACE TRAVEL AND A SASSY SPACESHIP. Originally, I simply sampled the kindle ARC and a few pages later I realized this was no sampling. This was a cannon ball/Olympic dive straight in. This is the start of a series done right. I begged this book to stop destroying me. It did not listen. Everything I've ever wanted in a book was in here. AH! I have become The Hype Queen of Books because of this story. Several Indian epic poems influenced the book and it was as apparent as the extra creativity used to make this world all its own. The Ramayana and the Mahabharata were definitely evident and executed very spectacularly. This book in general is spectacular. SO! There's not much else to say. Just, if you are the kind of reader to want to be destroyed by a book, love space and world conquering, enjoy political intrigue, feel connected to emotional characters, or just crave a damn good character driven book with plenty of action and adventure for any YA Fantasy THIS IS YOUR BOOK!! I was made for war, but I don't have war in my heart. Never has an emotional character been done so right, in my opinion. Esmae is picturesque. I adored every single character: good, evil, and neutral. Everyone was cherished. Everyone had background and was thoroughly characterized, given positives and negatives. They were real people. That's why this book destroyed me. I grew attached and one of my attachments slipped away. Other attachments betrayed me, and some attachments grew even closer to my heart. There were times I knew exactly what twist was being sewn in what moment. But I never knew what those seeds would reeped?! AND there were a plethora of hundreds other twists and turns and truths revealed that I'd never guessed coming, but they made sense! AH! Just read it. I can't stop talking about it. I loved it. You may just love it too. So give it a shot, please. Now excuse me while I go preorder the hardcover, the paperback, the next two books, and hope for the best that I can live in these pages. If you remember only one thing when I go, Esmae, remember this: you are beloved by gods you don't trust and will be betrayed by mortals you do. Damn. That about sums up this book. And it has been added to my favorites shelf along with my Dump-The-Slump shelf!! THIS BOOK IS BRILLIANT AND GLORIOUS AND HEARTBREAKING AND ALL OF YOU NEED TO READ IT! Years ago, I read Sangu Mandanna’s debut novel. While I wasn’t exactly blown away, I thought it’d be worth returning to her work later on in her career. So when I heard about her second book, A Spark of White Fire, a young adult sci-fi novel inspired by the Mahabharata, I decided to give it a go. And as it turns out, she’s really grown as a writer! A Spark of White Fire is an entertaining entry to the field of young adult SFF, and I have a hunch that it’ll be one of my favorite YA novels of 2018 Years ago, I read Sangu Mandanna’s debut novel. While I wasn’t exactly blown away, I thought it’d be worth returning to her work later on in her career. So when I heard about her second book, A Spark of White Fire, a young adult sci-fi novel inspired by the Mahabharata, I decided to give it a go. And as it turns out, she’s really grown as a writer! A Spark of White Fire is an entertaining entry to the field of young adult SFF, and I have a hunch that it’ll be one of my favorite YA novels of 2018. Esmae is an exiled princess, only no one knows it. At birth, she was separated from her twin brother, Alexi, heir to the kingdom of Kali, and grew up in an orphanage of a neighboring kingdom. Luckily, she was a favorite of a goddess, who made sure that Esmae received an education fit for a princess. Flashforward to the present day, when her uncle has seized the throne of Kali and Alexi is trying to raise an army to retake his throne. Key to his plan is entering a contest to fight for the spaceship Titania, which the gods have promised is undefeatable. Only, Esmae has a plan of her own, which requires revealing her true identity and winning the Titania herself. If she can convince her uncle she’s on his side, then she can be a spy for Alexi within Kali itself. Only, Esmae is new to the family history and drama, and she never wanted war in the first place. In the world of A Spark of White Fire, gods are immortal and divine beings who take an interest in the human world. While they cannot directly interfere with a human’s fate for risk of losing their godhood, they can exert a great amount of influence. It is because of the gods and their rules that most modern weapons have been banned, in an effort to decrease casualties. Wars are fought with bows and swords, in hand-to-hand combat. Spaceships have some more advanced weapons, but they are limited in their uses. Before the gods’ rules on warfare were explained, I’ll admit that I was confused as to why the contest for the Titania involved archery in a science fiction setting. However, I think that the rules of warfare is a great example of how aesthetic can be woven into a story without compromising plot or world building. A Spark of White Fire could easily be called a space fantasy — a nominal science fiction novel that resembles a fantasy novel in the plot and some aspects of world building. It’s also a clever way to bring in elements of Indian mythology and the Mahabharata. I really enjoyed the influence of the Mahabharata, although I’ll admit that I’m not super familiar with the source material. Most of what I know comes from reading a retelling, Chitra Banerjee Divakaruni’s The Palace of Illusions. Reading A Spark of White Fire, I would occasionally have sparks of familiarity with elements such as the contest for the Titania. If you’re familiar with the mythology, then that adds another layer of depth to A Spark of White Fire. If you’re not, or like me have only a passing familiarity than it is still a story that holds its own. Before I dive into characters and plot, there’s one other world-building concept I want to comment on: lack of sexism. Women in A Spark of White Fire are just as likely to be trained as warriors, and there’s never any comments about Esmae’s fighting skills being unusual because she’s a girl. Actually, I can’t remember anything that suggests sexism is a thing in this universe. Relatedly, Mandanna also includes some queer supporting characters, and homophobia doesn’t appear to be present either. Some of A Spark of White Fire‘s plot beats may be predictable, but that’s okay. Tropes are tropes for a reason: when used well, they work. Besides, with any type of mythology retelling, you’re going to get at least some predictable elements. What matters is that the story itself is engaging and well told. 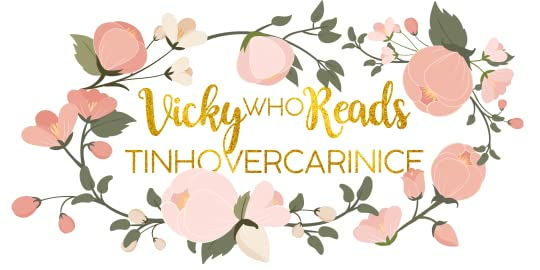 If you are a regular reader of my reviews, then you probably know that I’m not a huge romance fan. Actually, it’s more accurate to say I tend to dislike it. This is particularly a problem for YA novels, which tend to be obsessed with romantic plotlines, and personally annoying tropes such as insta-love and love triangles. For those curious, A Spark of White Fire does not have a love triangle! While there is a romantic subplot, it didn’t annoy me. The love interest, Max, is the adopted son of Esmae’s throne-usurping uncle. Only, the uncle doesn’t actually treat Max like a son. The romance itself is a slow enough burn that it never felt out of left field, and I think Esmae and Max do have traits in common and similar values. Both are outsiders as a sort, and both wish to avoid war and to heal the broken family. All in all, it’s a romance that I found believable and that didn’t actively annoy me, which is always a win! If you’re looking for a young adult SFF story with complicated family dynamics, curses, and a female lead who can hold her own in a fight, then A Spark of White Fire is the book for you. So this was supposed to be a Mahabharata/Indian folklore retelling, which I honestly don’t know much about. I loved the idea of this girl who was fighting for something that wasn’t necessarily for her. Granted, she did want to be home, but overall what she was doing was for her brother to get his kingdom back. It made for an interesting premise, because I honestly though that when she attempted the challenge that it would be all about her desires. The romance in the story was a little stinted, I was…but wasn’t expecting it, and personally thought it could go without, as it didn’t actually add to the story. Maybe it will come to play in later books? Ever hear the words “sci-fi fantasy” and think, that’s two different genres? Well, somehow Mandanna manages to put old timey fantasy in space…with space ships. There are moments of archery and talk of swords and maces, chariots, etc…on space stations and inter planet travel. In the midst of all this actual sci-fi fantasy combo, we have some celestial beings and fates that come into play. All in all, I mostly enjoyed the juxtaposition that was created, however, there were parts that I thought, okay, well that’s just convenient. None the less, it worked! This is the type of book that leaves you thinking, “What did I just read?” immediately followed by, “When can I have more?” There were so many surprises to the story, and I found myself completely engrossed. When I started reading this, I thought I knew generally where it was going to go—the storyline seemed familiar. (And not because it’s based on the Mahabharata.) A girl lies to everyone and pretends to ally with one side of a war so that she can actually spy and get information to help the other side. I mean, she’d obviously fall for the “bad guy” and he’d find out her secrets and everything would fall apart. Except, that’s not how it all worked out—at least not exactly. And of course, I can’t tell you what did happen, but I will say that Mandanna made her characters smarter than that, and more compassionate, (and sometimes more villainous). Basically, every time I thought I knew where the story was headed, it swerved the other way, and by the end I was completely blown away by where Mandanna left us. Inspired by ancient Indian stories. I didn’t remember when I started this that it was based on the Hindu religious tradition, but when I saw it afterward it was an aha moment for me. I’ve only ever read one other thing based on the Mahabharata, and that was a short story (in A Thousand Beginnings and Endings, if you’d like to check it out). That short story gave a brief description of the original tale, so I can now see the parallels—and maybe some of where the story is going. (Yikes!) Basically, the fact that this was based on the Hindu religion means it’s filled with gods and goddesses, epic battles and love stories, and a bit of treachery and trickery! This sort of goes along with my last point, but I’m talking about Esmae herself here too. Esmae is an incredibly strong character, but she’s also compassionate and forward-thinking. She doesn’t just let herself be swept away by fate—she fights it tooth and nail. And almost every character is fully developed and feels real. Even with the one character who truly does fit the bill as a villain, we get a tiny glimpse of compassion from. This is one of those cases where I’m scratching my head trying to think of things I didn’t like. I mean, there were moments that I didn’t love what was happening, but I empathized with these characters so well that I felt like I could understand why they made every decision they did. And sometimes the capriciousness of the gods got to me a little, but … they’re gods. So, yeah, I pretty much liked everything. A Spark of White Fire is an epic tale of love, jealousy, hope, and betrayal. When the gods are on your side, it might be a blessing or it might be a curse! I am eagerly awaiting the next book in this fantastic new series! You may also find this review on my blog here. I received an e-ARC through Edelweiss in exchange for an honest review. The thing about A Spark of White Fire is that it could have been an outstanding book. Morally gray characters? Check. Political intrigue? Check. Badass gods and goddesses and equally fearsome warriors in space? Check. Here’s the thing: I was a huge fan of the beginning and the end of the book. The first fe You may also find this review on my blog here. Here’s the thing: I was a huge fan of the beginning and the end of the book. The first few chapters completely won me over, and I was breezing through this book up until the 30% mark. The ending was just as breathtaking. I skimmed everything else after the 59% mark, but the last few chapters had me on the edge of my seat. The way everything fell into place was clever and unnerving in the best way possible. But the middle? It was okay. I can see and understand how readers would be engrossed with the story from beginning to end, but I couldn’t get into it mainly because of two things: the main character’s motives and the way it was written. The motives of our main character, Esmae, were hard to fathom. She did things out of her love for her family, but how can she swear to love them so much if she’s never even met or known them? Everything she did, everything she’s sacrificed—it was all for them. But literally how is she so attached to them without having ever interacted with them prior to this? Another thing that didn’t resonate well with me was the writing style. The story was written to tell, not show. There were so many moments where scenes just jumped between one sentence and the next, scenes where characters were introduced and branded with a trait that then defined them for the rest of the book. It created such a disconnect between me and the rest of the characters other than Esmae because we were told, “This character is a bad egg!” without having the said character even prove their awfulness. I decided to ask this book for an E-arc on a whim and I did well because I loved freaking love this book. Imagine the perfect mix between science fiction and mythology, because in this world, there are whole populations with governments and kings living on spaceships or planets across the galaxy, but the gods are still alive and interact with humans. It immediately reminded me of Greek mythology where the gods had their own champions, and even if the gods are not Greek, there are many similaritie I decided to ask this book for an E-arc on a whim and I did well because I loved freaking love this book. Imagine the perfect mix between science fiction and mythology, because in this world, there are whole populations with governments and kings living on spaceships or planets across the galaxy, but the gods are still alive and interact with humans. It immediately reminded me of Greek mythology where the gods had their own champions, and even if the gods are not Greek, there are many similarities. It's a world I loved for its richness and the mix of genres is very successful. Moreover, there was also a singular atmosphere with curses and prophecy, in short, it was so cool. Esmae is a heroine who is an orphan, her mother abandoned her on a ship, but a goddess decided to save her. After all, Esmae is a princess, her destiny will be great and after all she is a favorite of the gods. She is a great heroine, strong, intelligent and thoughtful, and even if sometimes the emotions around her family are complicated she does what she thinks is right. She is a heroine who is just human and I loved her for that. In addition, the end of the book announces a very interesting evolution for her in the sequel, let me tell you, I can not wait for it. The rhythm of the book is extremely successful, there is suspense from the beginning to the end and over the pages it increases and this ending was just amazing. This is a book that has a great universe, a badass heroine and an intriguing plot from start to finish and that has been a great surprise because I didn't expect anything from this book. As you may have understood, I loved this novel and I recommend it warmly. A Spark of White Fire is this gorgeous mash up of destiny, space, diversity, and gods/goddesses. It's entrancing. You lose yourself somewhere between the fantasy, the spaceships, and Esmae's journey to find her family. It's a book that makes you question fate, family, and trust. It's a book that grows its characters and deepens its resolve. And it's only the beginning. Overall, this story spoke to me on so many levels, and it was so, so gorgeous. This is easily one of my favorite YA SFF books of all time, and one of my favorite books, period, in recent memory. It is...I'm very excited, is all, I'm very excited by this book, and very excited for more.